After much late night panicking and planning we managed to get everyone to the train station complete with sleeping bags. 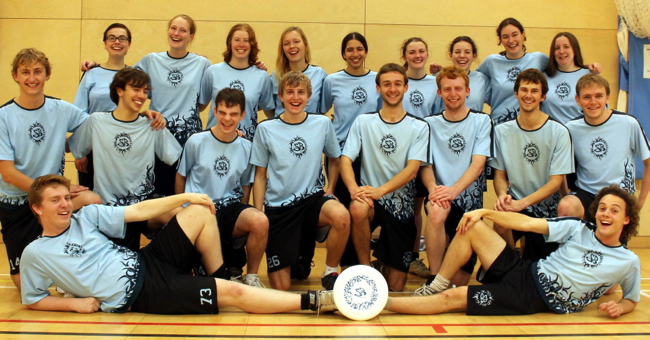 We got on the train and arrived in Oakham ready to go out and destroy our seeding in Midlands University Mixed Indoor Regionals (MUMIR) 2013. We came out very strong and got in an early lead. They then turned their D on and got back into the match. With a minute to go it was 7-7. Lincoln were the seed above us in our group so winning this match put us well on the way to Nationals. We knew this would be a tough match. They were the top seeds in our group. We couldn’t stop their well rehearsed O of a high release bladey break forehand to their tallest guy who could out jump everyone on our team. We went into this game knowing that if we won it we would finish second in our group, be seeded 8th and only have to play the 8v9 crossover to stay in the running for a spot at nationals. We were not expecting an easy game, but we knew we could do it. Unfortunately, this was the match we didn’t fully turn up to. Our offence got sloppy and we forgot how to dump and swing, meaning we turned far too easily and didn’t manage to threaten the Loughborough seconds even though Lincoln had taken them 10-1 earlier in the day. This was the crossover we had been dreading: The 11v6. However, having watched the Bears play earlier that day we knew we had a good chance. We came out hard and they put up a zone but, being from windy Cambridge, we knew what to do and went 3-1 up. The Bears switched to man and we started to slip back slightly to our O against Haze 2, letting them get a 5 point streak. Although we started a comeback it came too late. Back at 11th seed our hopes of nationals were over. On the plus side we could now go out and win the plate after a lovely lie in. We made our beds and headed into Oakham with the hope of finding all the frisbee players. We ate at Spoons which was full, but there wasn’t a frisbee player in site. On the way back we tried the infamous Brewery, all we found was a (quite good) band. PotD (Play of the Day) nominations included Fran catching a D’ed disc just before hitting the floor and Sarah’s bookends (getting a D and then scoring a point). After watching our second team win their first two matches, both against first teams and so achieving one of our aims for the weekend, we were ready to beat Bears 2 and guarantee breaking seed. Bears 2 were the only team in the tournament with a shorter average height than us but they more than made up for it with some amazing vertical leaps. We went out and worked hard with both teams trading breaks. The lead changed a few times but our chiller offence and great D meant that as it came to the final hooter we were ahead. It was a rematch of our first game of the tournament which we had won in sudden death. We had changed into our dark shirts earlier in the day to avoid putting on sweaty clothes from Saturday and all of Lincoln’s light kit, if worn, had to be washed by their captain so it was decided that the loser of the toss could decided kit as choice of ends did not give any advantage. Unfortunately we lost the toss but for some reason Lincoln choose kit over offence. So went in and played some good ultimate making full use of Hannah as an iso resulted in very quick offence points while our defence really managed to slow them down and break them leading us to victory and a shiny trophy. This was our best match as a team and after the match Lincoln voted Hannah MVP, which was well deserved. After taking many group photos everyone gathered for the presentation. There was no spoon and the organisers somehow broke the bowl for the winners so we got the only piece of silverware on offer! A lovely sharpy ‘engraved’ £1.49 plate! The MVP’s for the weekend overwhelmingly went to James Richardson for the firsts and Sarah Thomas for the seconds, for which they received mini frisbees. We may have not made it to nationals, but we bettered SB’s results at the last few MUMIRs, next up is Mixed Outdoor Nationals.